Let me preface this post by saying YOU ARE INSANE IF YOU DON'T TRY THIS RECIPE!!! I love lasagna. Heck, I love all types of Italian food and any and all noodles. So I was thrilled when I came across this gem of a recipe. 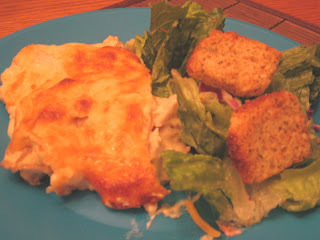 I tweaked a few different White Chicken Lasagna recipes to create my own; as most home cooks probably do anyways, right? I'm tellin ya this was one of the best meals I have ever had in my entire 30 years of life on this earth. Try it. You'll be smiling for several days afterwards. In a large sauce pan, over medium heat, brown onions & garlic in butter. Add cream cheese, cream soup, sour cream. Stir until cream cheese is melted. Add chicken. Add oregano, basil, and parsley. Mix together and heat through. Spray bottom of 9X13 baking dish with non-stick cooking spray. Layer noodles, white sauce with chicken, then cheese. Repeat steps to create 3 layers, ending with mozzarella cheese on top. Bake at 350 degrees for 35-40 minutes or until top layer of cheese is browned. P.S. Sorry there's so much "red" in my picture. I have a terrible camera. Trust me. It's AWESOME. I am making this tomorrow night for a dinner party!!! Thank you!! That looks heavenly! I will definitely be making this!